To me, "traditional" includes from the Renaissance through Realism, not including (although I like the art forms) impressionism and later. A "Modern Traditional Style" includes a lot of 30's 40's American art... Why the Renaissance? The ancient Greeks were in what I would consider a “traditional” mode; in fact, they could be considered to have invented it. 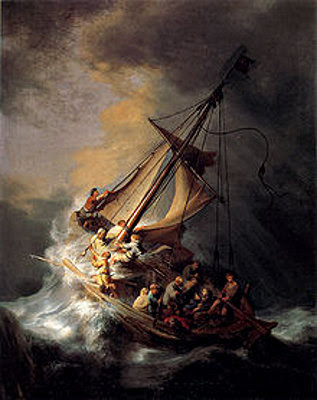 But afterward, western art became very much church oriented, which seems to me to be quite different; and didn't begin to break away until the Renaissance. Although a bit argumenative, I don't include “Gothic”, also very much church oriented. In spite of wide variations in specific style, a fundamental “idea” is common. Traditional: use a realistic method to show a human-traditional motif. Modern art (broadly speaking): more into the art “appearance”; relations to traditional motifs take only a small or zero level of importance. However some earlier forms, and definitely “modern american art”, relate strongly to traditional, in the sense of using somewhat realistic painting forms and human-related motif, but with a somewhat more modern artistic style. Beyond “modern” we get into various flavors of “contemporary”. My own view: curious, decorative, not really interesting. "Roger Scruton has written an important article on modern art, one that I encourage you to read in full. It begins with the question of what high art is for. Scruton observes that modern art is transgressive and aims to shock and confront. Traditional art was oriented more toward beauty. Modernists do not feel at home in the world, and therefore aim to desecrate: the mockery, the cultivation of ugliness and the moral transgression is aimed as a pre-emptive strike [Well, really, so what?] against the deeper experience of beauty referred to above. ..."
'Even artists working in traditional mediums like painting can create modern masterpieces. Those not coming from a background in the arts often have difficulty realizing the profound differences between traditional and modern art. While many of these differences are rooted in the social circumstances under which art has been historically produced, there are also differences that you can discern by simply looking at the two types of art. 'Subject Matter and "The Shock of the New"
Whereas traditional painting and sculpture was nearly always based on the human figure or the landscape, modern art broke with this tradition in what is commonly referred to as abstract art. In abstraction, nothing that we are able to recognize from the real world appears in the painting or sculpture. 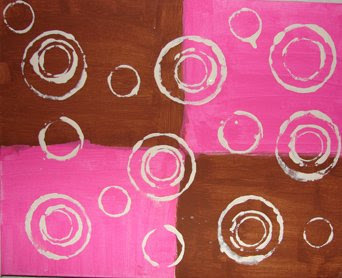 Rather, the artist conjures shapes and designs from his imagination and projects them into his own visual space. One prominent example of abstract painting is Joan Miro's "La Leçon de Ski" (1966). 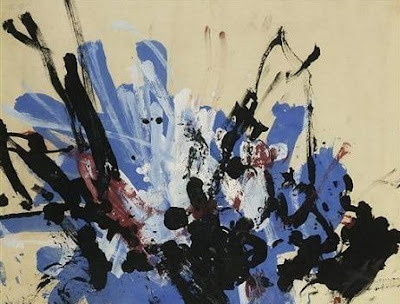 A group of artists in New York in the 1940s and 1950s known as the Abstract Expressionists would take this even further by privileging the act of painting itself over the finished product. 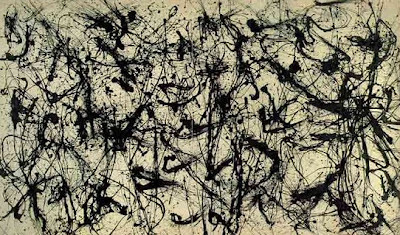 Jackson Pollock is perhaps the most famous member of this group. "Contemporary art can be defined variously as art produced at this present point in time or art produced since World War II. The definition of the word contemporary would support the first view, but museums of contemporary art commonly define their collections as consisting of art produced since World War II. "...the question of what constitutes art. This concern can be seen running through the "modern" and "postmodern" periods. 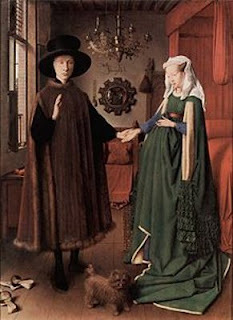 ...what art is taken notice of by galleries, museums, and collectors. Serious art is ultimately exceedingly difficult to distinguish definitively from art that falls short of that designation." Too much, maybe 100%, contemporary art certainly is not "serious"; too much, apparently, only dedicated toward centemporary artists/galleries into being 'new' and 'selling new stuff'. Congo paints contemporary art. Congo is a chimpanzee. "A German art expert was fooled into believing a painting done by a chimpanzee was the work of a master. The director of the State Art Museum of Moritzburg in Saxony-Anhalt, Katja Schneider, suggested the painting was by the Guggenheim Prize-winning artist Ernst Wilhelm Nay. "It looks like an Ernst Wilhelm Nay. He was famous for using such blotches of colour," Dr Schneider confidently asserted. 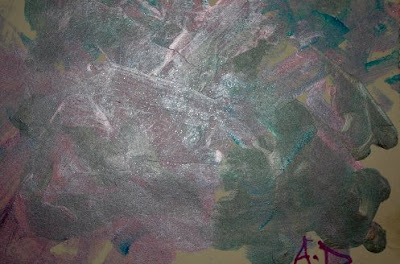 The canvas was actually the work of Banghi, a 31-year-old female chimp at the local zoo. Oh, I know that the postmoderns have plenty of rationalizations -- that interpretation is all subjective, for example. While such rationalizations may fool some honest folks, none manage to completely conceal the pretentious charlatanism of the whole enterprise of modern art. Most sensible people, I suspect, are so wearied by the steamroller of our postmodern culture that they even cannot rouse themselves to righteous indignation." 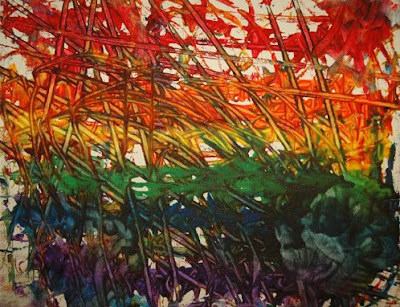 "He used hardened brushes, sticks, and even basting syringes as paint applicators. Pollock's technique of pouring and dripping paint is thought to be one of the origins of the term action painting. With this technique, Pollock was able to achieve a more immediate means of creating art, the paint now literally flowing from his chosen tool onto the canvas. By defying the convention of painting on an upright surface, he added a new dimension, literally, by being able to view and apply paint to his canvases from all directions. "In the process of making paintings in this way, he moved away from figurative representation, and challenged the Western tradition of using easel and brush. He also moved away from the use of only the hand and wrist, since he used his whole body to paint. 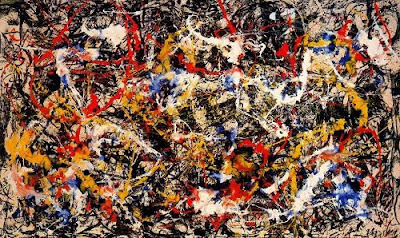 In 1956, Time magazine dubbed Pollock "Jack the Dripper" as a result of his unique painting style. "My painting does not come from the easel. I prefer to tack the unstretched canvas to the hard wall or the floor. I need the resistance of a hard surface. On the floor I am more at ease. I feel nearer, more part of the painting, since this way I can walk around it, work from the four sides and literally be in the painting. 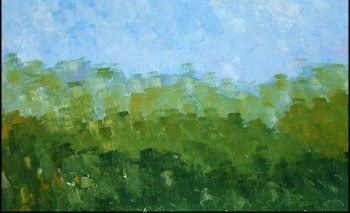 "I continue to get further away from the usual painter's tools such as easel, palette, brushes, etc. I prefer sticks, trowels, knives and dripping fluid paint or a heavy impasto with sand, broken glass or other foreign matter added. "When I am in my painting, I'm not aware of what I'm doing. It is only after a sort of 'get acquainted' period that I see what I have been about. I have no fear of making changes, destroying the image, etc., because the painting has a life of its own. I try to let it come through. It is only when I lose contact with the painting that the result is a mess. Otherwise there is pure harmony, an easy give and take, and the painting comes out well." A profile in the 8 August 1949 issue of Life magazine introduced Pollock’s art to Americans and secured his growing reputation as one of the foremost modern painters of the time. During this intensely creative time, Pollock was treated by a doctor who substituted his drinking with tranquillizers. In 1951, he began drinking heavily again. Titian, probably a self portrait. 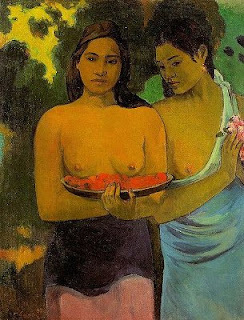 To me the idea of traditional-modern is to keep the human-related motif but using a more modern, lighter, painting style. 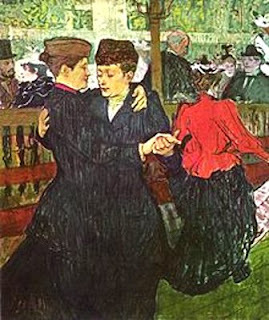 Although of course impressionism moved in this direction, the painting style was changed in more fundamental way than fit my own feelings. 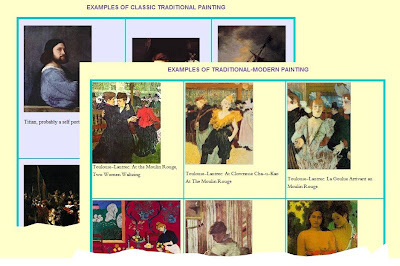 However, after impressionism lost it's “newness”, somewhat less aggressive forms were developed, by some French and American painters; here are some examples. His first one-man art-gallery exhibition as a fine artist was on July 9, 1962, in the Ferus Gallery of Los Angeles. 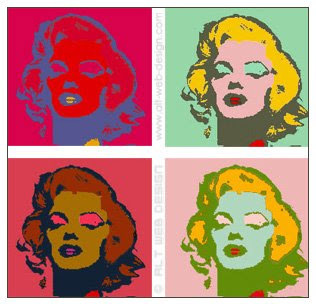 The exhibition marked the West Coast debut of pop art. 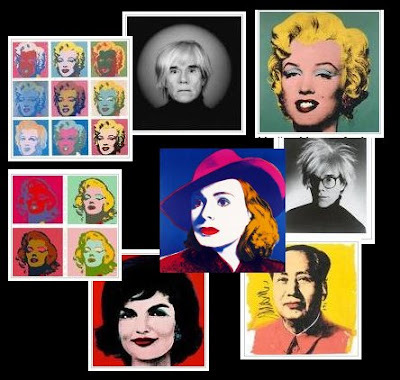 Andy Warhol's first New York solo pop exhibit was hosted at Eleanor Ward's Stable Gallery November 6–24, 1962. The exhibit included the works Marilyn Diptych, 100 Soup Cans, 100 Coke Bottles and 100 Dollar Bills. While surfing the web, I recently noticed several websites devoted to paintings...from animals. 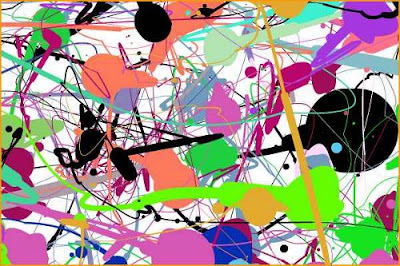 Now, most of the paintings are a rainbow of scribbles (though they would make top-quality modern art), because they're done by animals, but some actually are very nice, abstract paintings, especially for an elephant or monkey. Of course, that is assuming that the elephants and monkeys are the ones painting those pictures. ... In particular, one elephant by the name Duanpen does most of the landscapes and all of the good ones. His art, below on the right, is just amazing for an elephant. Now, what elephant has the attention span, fine motor skills, visual techniques, intelligence, and forethought to be able to make something like that? Does Duanpen? I really can't tell how real this art is, and I will leave it up tp the reader to decide for themselves. Go to www.elephantart.com, and look at some of their artists. The first picture I showed was by Lucky, and it was her #100 painting. The second was by Gongkam, his #51 painting, and the third was by Duanpen, and that was his CV#021 painting. The picture of an elephant is Gongkam painting another one of his flower pictures. "If an artistic genius were by some miracle to appear in this age of mediocrity, he would find endless subjects for his brush in New York City despite the indications of proliferating theorists of the square. Buildings, store windows, the docks, ships, multi-colored taxi-cabs -- the color and energy of the city -- as well as the expressions on people's faces and the slump of their postures that tell the story of the city's toll and the course of their individual destinies. "It's easier though, if you're an artist, to ignore reality. It's easier to leave the street and the problems of men behind and retreat to your studio where you can consider the essence of the intellect. The things that really matter. 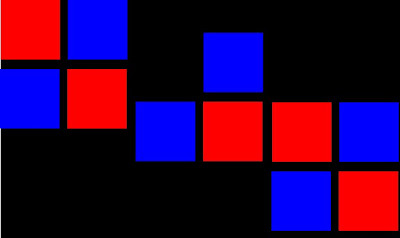 There you can decide whether to paint a red square or a blue one. Or whether you want ten stripes or eleven in your latest stripe painting (my own italics). "Don't let life and death, injustice, physical and emotional suffering, hunger, brutality or all the nameless hard-felt longings and desires of men -- much less irrelevancies like artistic beauty, meaning and purpose -- interfere with the important decision you're about to make. That neon tube you're going to call a sculpture. Do you want it seven feet long...or eight?" 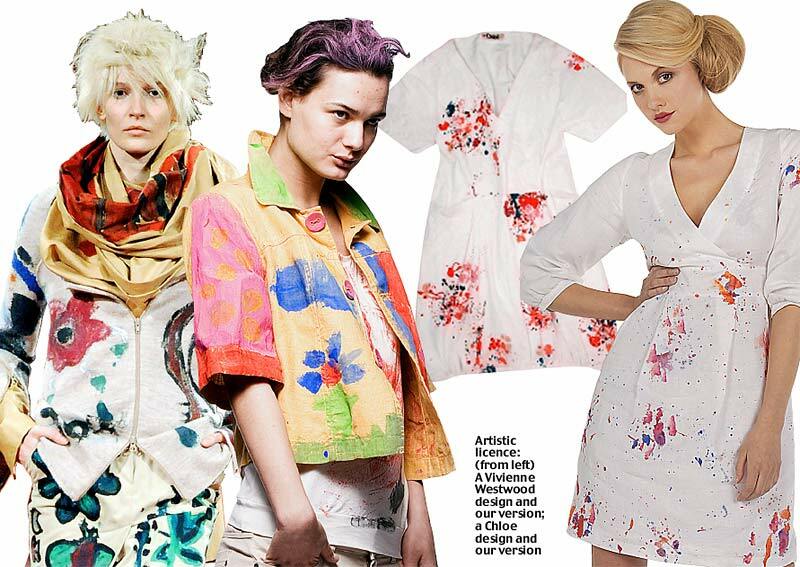 "Artistic licence: (From left) A Vivienne Westwood design and our version; A Chloe design and our version"